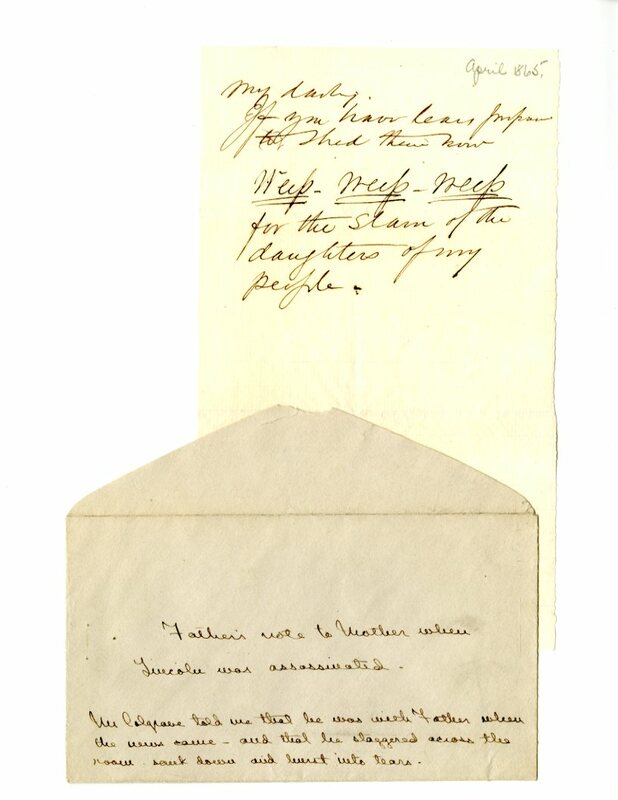 A short, personal note from Joseph Albert Wheelock, a journalist in Saint Paul, to his wife Kate French Wheelock, commenting on the assassination of President Lincoln. It reads: "My darling, If you have tears prepare to shed them now Weep - Weep - Weep for the Slain of the daughters of my people." The envelope with it is just as interesting: "Father's note to Mother when Lincoln was assassinated. Mr. Colgrave told me that he was with Father when the news came - and that he staggered across the room sank down and burst into tears." My darling, If you have tears prepare to shed them now Weep - Weep - Weep for the Slain of the daughters of my people.